So do not you ever say to them 'ah', and do not snap them. [QS. Al-Isra '(17): 23]' Uquuqul walidain (disobedience to parents) is a major sin. Because of this, the Messenger of Allah. as quoted by Ibn al-Athir in his book An-Nihaayah prohibits acts of disobedience to parents. Someone said 'aqqa waalidahu, ya'uqquhu' uqaaqan, fahuwa 'aaqun if it had hurt her parents, mendurhakainya, and has come out of it. This word is the opposite of the word al-Birru bihi (worship him). The word al-'uquuq (lawlessness) is derived from the word al-' AQQ which means ash-syaq (break) and al-qath'u (cut). Thus, a child is said to have been disobedient to his parents if he did not obey and did not do good to him, or in Arabic is called al-'AAQ (the rebellious child). Plural of the word al-'AAQ is al-' aqaqah. Based on this concept, the hair coming out of the head of a newborn baby from the mother's abdomen is called the aqiiqah, because the hair would be cut. What is meant by al-'uquuq (lawlessness) is breaking the "stick" of obedience and "cut" (cut) rope relationship between a child with his parents. So is the act of disobedience to parents is a break "stick" obedience to them, to cut ties with the relationship between parents and their children, leaving something they liked, and did not obey what is commanded or requested by them. 1. Say "ah" to parents and raised his voice in front of them when it dispute, and also not providing a living to parents when they need it. 2. Do not serve them and turn away from it. More insubordinate again when telling parents Cursing serve him and his parents in front of the crowd and mentioned shortcomings. 3. Sharpening the eyes of both parents when angry or upset with the two of them for some reason. 4. Making both parents grieve by doing something, even if the child has the right to do so. But remember, the right of the parents over the child outweigh the rights of the child. 5. Ashamed to admit his parents in front of the crowd because of the circumstances of his parents were poor, look tacky, not knowledgeable, disability, or other reasons. 6. Not willing to stand up for the respect of parents and kissed his hand. 7. Sitting and talking precedes parents without asking for permission when he led the assembly in which the parents are present in the assembly. 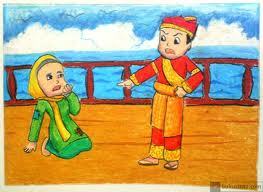 It's pompous and arrogant attitude that makes parents terlecehkan and angry.